If you have ever been curious about adding a logo design to a QR code then Brian over at Hack-a-Day has writte “How to put your logo in a QR code“. Brian was inspired by some previous attempts at this artform notably when Duncan Roberts, software engineer at the BBC, created the BBC’s own logo in a QR code for BBC Progammes Beta. If you think one is limited to bitmapped images then Brian has shown that you can also add colour, and even higher resolution images such as the IBM and Firefox logo. Brian clearly states that the Firefox logo he has created is just for example, but with some colour and pixel optimisation it could end up looking a little better. QR codes are becoming increasingly important so it makes sense we try to bring some creative and practical harmony to these square blocks with our designs. Some feel they should just be left as they are, so long as they scan that’s all that is important, and some feel that they should be more visually integrated within the surrounding area. Barcodes had the same problem yet it’s only relatively recently that creative barcode design has really taken off. Although it’s probably bordering on extreme cheesiness, for the most part. 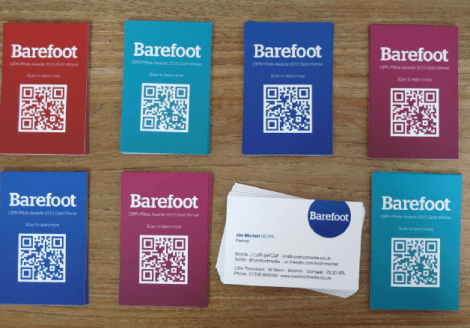 Even Moo.com have printed QR cards on business cards so it’s time to get over barcodes and fully embrace the rawness of the QR. Have you tried playing with QR codes or have you examples of logo designs efficiently melded into a QR code?